This past week was a whirlwhind going from the Yakima, to the Klickitat, to the Grande Ronde to the Snake! The Klickitat blew its top on Wednesday night of last week and with 10 of our best longtime "buddy guests" at the lodge we had to make a plan. After getting up at the Klickitat Lodge Thursday morning around 5:30 am it was apparent by looking at the online flow chart that Klickitat would be looking more like the Mississippi by lunch time. We had been up late the night before "chatting strategy" haha over a few cocktails so I thought that getting the crew out of bed early to drive 5.5 hours to the Grande Ronde might require some finesse. Everyone jumped on the band wagon and was IN! With this crew it was no problem getting takers. I fish with a lot of folks and I'll confess that it is a very special thing when you are around a group of anglers that are up for any adventure, and simply want to make the most of their recreation time whether conditions are good or bad. There was no backing down from the challenge here! Our guide team really stepped it up too. Trust me when I tell you nobody is more uncomfortable with a major audible than the guide team. A day off watching Sportscenter would have sounded pretty good at this point in the season, but it was time to fish! We wouldn't normally relocate to a river that we weren't recently familiar with but with longtime guests it was the right call. Day 1 - Steve rolled in early and didn't wait for us. He sent me a text that said... "going fishing, just look for two doubled-over spey rods on the Snake"... We drove up the Snake and found him. The rods weren't doubled over at that point but it did happen twice that night! Steve stayed on the Snake with 3 anglers and I went to the Ronde and we wade fished and put one Steelhead on the bank on there. We got about 3 hours of good fishing in which certainly beat the alternative of going home! Luck is an attitude. One of the guests landed 2 fish on the Swing that evening one of which went a taped 32.5" ! We had an awesome dinner at the German restaurant in Asotin, the server was the owner's daughter and she was awesome. Great food and a ton of fun. Day 2 - This was going to be our "long day" so we saddled up early and went to the upper portion of the Grande Ronde and floated various stretches. We all wound up at Bogan's by the end of the day somehow and had a great trip. Patrick caught his first steelhead on a swung fly using the Sage 7126-4 ACCEL. That rod has good mojo! So many first time spey casters have learned and hit their first fish on that rod recently. *Rob landing a nice Bull Trout picked up swinging on the Grande Ronde. Big take! One of the guys had to fly home in the afternoon so Steve ran him to the airport and then went back to the Snake. They got another one on the Snake and rounded out the day. It was another night of big fun at the same little restaurant again! Great dinner. This was a marathon, more than a couple fell asleep on the way back to the cabin. 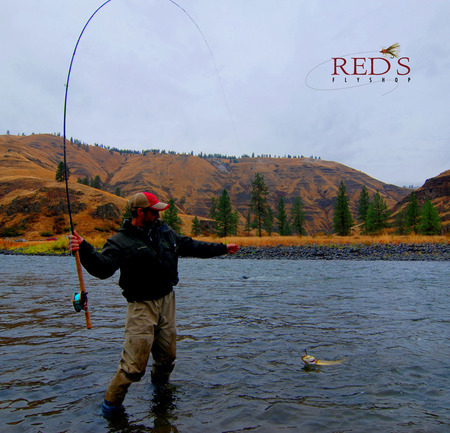 Day 3 - We wade fished both the Snake and the Grande Ronde. I fished with Matt, he is a GREAT spey caster and was very prepared for this type of fishing. He landed a gorgeous 10 pound fish throwing LONG casts on a floating line and a small traditional spey fly. It doesn't get any better than that! Later that day Michael landed his first fish on a spey rod, which was also his FIRST STEELHEAD ever. Caught the right way on a tight line, very cool. We drove home that afternoon with a successful improv trip in the bag. *Michael and Patrick both landed their first steelhead on spey rods with Steve this weekend! We had lots of fun which was made even better by the great attitude and spirit for adventure possessed by this group. The more I fish the more I appreciate when guys keep their expectations in check and are simply out to have a good time. I learned A TON on this trip about being better prepared for various situations and water types. I had gotten pretty comfortable on the Klickitat with Swith Rods, 12'6" Spey Rods, Single Handers, Skagit Heads, Heavy Tips, and larger spey flies. THROW ALL THAT OUT THE WINDOW! The Snake needs no explanation. It is a big wide river and coverage is king here. The Grande Ronde is much smaller, BUT the river structure has very broad runs with wide tailouts that will harbor a 90-100' cast if you can make it. And the fly will fish the entire way across. We had a few spey gurus as guests on this trip and although they had left their "big water" gear at home they had some heads with them that made the long cast much easier. Many anglers on these rivers fish exclusively floating lines, long leaders, and sparse flies. This is so different than our typical MO on the Klick. And it works. Getting Prepared Before Game Day - Seize the Moment! Everyone had a great time and did well, but the guys that were ready to play ball and had the right rod, line, and gear were at a big advantage. As guides we try to provide what gear we can, but when anglers are using new and different rods each day it isn't the same. Matt that was a guest had the right line, rod, and it was his gear so he was very familar with it. He was also a great example of being prepared before game day. He hooked several fish on spey flies and floating lines on long casts. That is a rush! He had his game on and because he had his own gear and had practiced we was able to seize the day! AIRFLO Rage Compact - A really nice casting line. It has a 30' head which is 7' longer than the typical Skagit head. It can be used as a floating line with straight mono leader on the end OR for rods 13' or longer add a 10' floating polyleader and you will cast more line and have to strip in less shooting line. RIO Steelhead Scandi Head (with thin mono running line) - This is a great "beginner friendly" line for long casts on big water with small flies. This would be the easiest way to convert your Skagit system to a better system for long casts on wide water. If you want to use the same reel/running line and are not confident with longer heads try this setup. RIO Spey Versileader Kit - These fly through the air so much better than traditional sink tips and MOW tips with small flies. They are easier to cast and pair well with traditional spey lines and Scandi heads. Big heavy tips will rob you of precious distance, these leaders are light and aerodynamic. I will admit that I am not the authority here on this, but I will say that everyone I know that is successful on these systems fishes small. They fish better, cast better and simply produce. We did catch fish on our "go to" of a Hobo Spey but smaller is better. The water typically very clear and having a big profile is not necessary. We boiled 2 fish on dry flies which was pretty good for the limited amount of time we fished them! You guys did an awesome job of setting up our group of 10 anglers for success on the Snake and Grande Ronde when the Klickitat was looking like a washout. Thanks for calling the audible and making it all work out in the end. Looking forward to the next opportunity! Steve and Joe get the job done and really make it fun. In the face of great challenges this turned out to be one of my favorite trips! Thanks again for your tenacious effort to deliver a great experience! "One more cast and I'm done..."